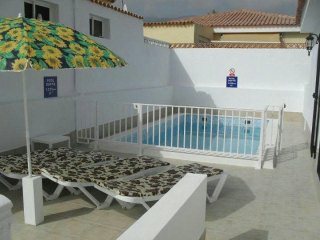 Villa Larkin is a three bedroom detached villa which sleeps up to 6 people. It is situated in the Callao Salvaje resort in Tenerife. It is laid out on one level and is therefore wheelchair friendly. There is a private heated pool, which has a fence around it, making it ideal for families with young children. The sun terrace is equipped with plenty of sun loungers, and there is also a barbque for those alfresco dinners. Inside the villa is well equipped including a washing machine. The lounge includes satellite TV and a DVD player. Two of the bedrooms have double beds and the third is a twin room. There is also a safe for guests use.